It was one year on the 24th of January as of 9:09 am since Les took his final breath as I held his hand in mine and felt my own heart lurch onward as his heart ceased forever. The terrible irrevocable finality of such a thing never leaves one. It is antithetical to everything else we experience in life. Relationships, jobs, and other outward signifiers end, but the other half of a broken relationship continues on with their life; the employer is still there even if we are working elsewhere; Nearly all of the other endings we experience in life have some thread of continued existence in the world albeit perhaps without a direct connection to us, but the death of someone we love is so shocking in its finality that our minds cannot really grasp it even as it is happening, much less afterwards. Time numbs us, but never strips the pain of loss from our hearts. As our daughter Sparky said to me, "It is weird how on the one hand it is hard to believe a year has passed since Da's death; it still seems like he just died yesterday and yet it amazes me how much has happened in this past year without him." 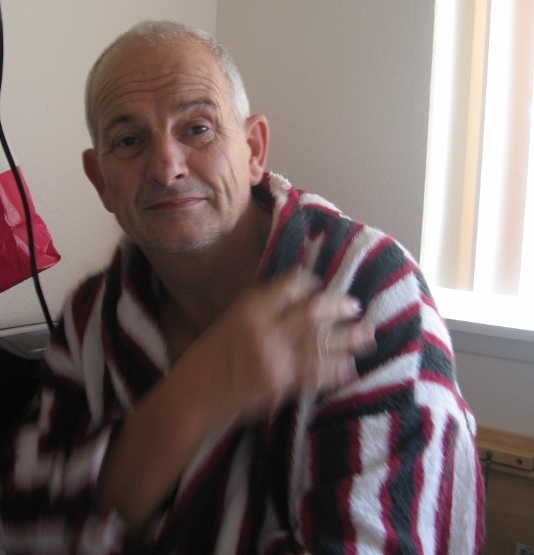 Les was so much more than my best friend, my soul mate, my spouse; he was my interpreter for all the things about this country which make absolutely no sense to the American mind. 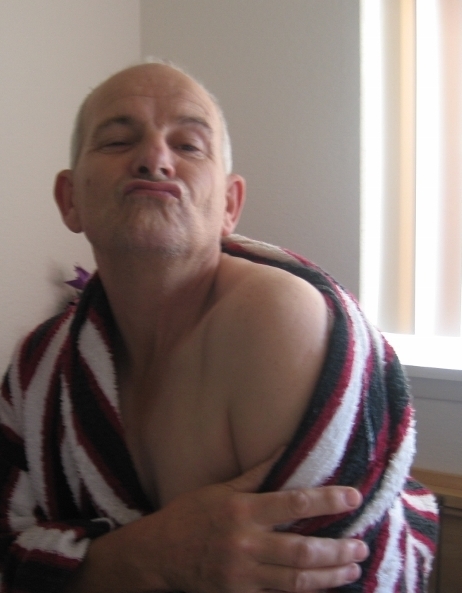 Les was also my shield and protector, something I never fully appreciated while he was alive, having never really had anyone who stood for me in that way before. I am eternally grateful Les began to write a blog as it has been my saving grace. There are days when I look at the pictures of our brief, happy life together framed on the wall and it feels as though those golden moments happened to someone else and I have come to consciousness in a nightmare from which there seems to be no escape. I simply have no desire to go on without Les and yet I wake up each day anyway. 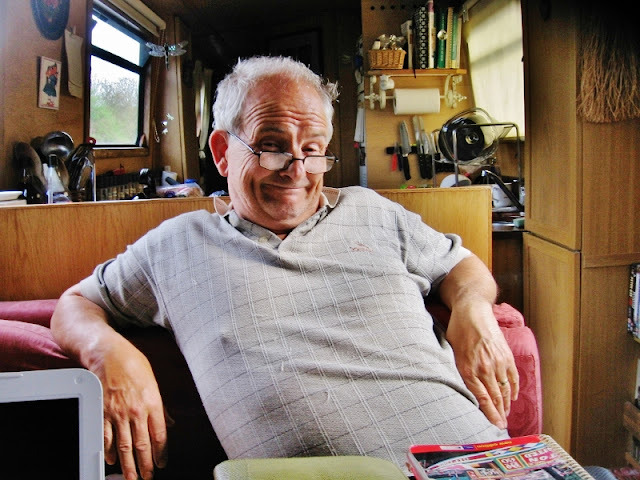 Opening the blog and reading through Les' posts helps to ground me again in the knowledge that it was not all a dream. We really did find each other and fall deeply, madly, and truly in love with each other. I have read this blog through from the very first post more than a dozen times now. Each time I find something new and different that catches my heart. I love seeing his rough tentative early posts full of mistakes and follies gradually giving way to smoother more polished writing as Les found his voice and began carrying his blog readers along for his journey as his confidence in being both a boater and a blogger grew. I cherish each funny bit that makes me laugh out loud--and for just that fragile moment Les comes back to me alive once more. I am walking a road I never expected to follow (yes of course I knew he was dying but our minds still shield us from that reality until the moment it happens and then we find our minds wrapped in a cotton of denial afterwards)--and if we are honest about it, no one does. We don't look ahead to the death of our spouse or partner and ask ourselves out of curiosity, "Gosh I wonder what my life will be like when they are dead?" No one wants to go there, but life may take us there anyway, and so I hope in sharing my feelings and experiences they will be of some help to those who find themselves on this road sooner than they expected. I can only offer my deepest gratitude to our friends who have stood by me over this most difficult year. I won't mention names--you all know who you are; each of you have my love and thanks which will never be enough to repay your kindness. I can't imagine I would have made it this far on my own without any of you. My thanks as well to those of you have Instant Messaged me and emailed me to thank me for sharing my inner most thoughts and feelings honestly. It is not to bang the "Poor me "drum as I need no one's pity. If that is what you take away from my posts then you need to move on and read someone else's blog. I know how isolating and terrible this journey can feel and if my writing validates even one person's experience and helps others to feel connected and less alone then it is worth sharing. Your messages to me are precious and while you choose not to comment publicly on the blog I appreciate those who have reached out to me in other formats to thank me for sharing honestly. Right so on to other things now. The boat has been out of the water for repairs, more of which I will cover in a later blog once I get pictures from the ME who undertook the work. The diesel tank was cleaned and the fuel polished with the result that there was indeed diesel bug in the tank waiting for an opportune moment to clog up the engine. Since the cleaning I have noticed the Ebispacher diesel hot water heater runs more smoothly and lot quieter as does the Vetus engine. It also isn't exhaling huge clouds of smoke when I start the engine anymore. This is the equipment used to clean and polish the diesel. It took just over two hours and was fascinating to watch. When the process was complete this is what was pulled from NB Valerie's diesel tank: water and a thick layer of contaminant loaded with dead diesel bug and bits of rust. The dark gloopy stuff is diesel bug. It has been awhile since I posted. I was stricken with the dreaded flu and I have been so ill as to be useless. It was all I could do to keep the fire going. I have had all the symptoms bar vomiting; nausea bad enough to stop any thoughts of eating. I went five days with nothing but water and a bite of toast here and there. My eyeballs felt like mashed grapes and I hurt everywhere--even my teeth and eyelashes ached and throbbed. This particular strain of flue brings a bronchial infection along for the ride and I have also been fighting that off, laying propped upright in bed hacking up Phlegm but feeling like I might just cough up a lung along the way, desperate for sleep but to no avail thanks to the constant wet whistling of my lungs. Last Wednesday was the first day in six that I could stand up without feeling dizzy. My lungs are beginning to dry up but I still feel desperately weak which is extremely frustrating. Even when I was recuperating from knee surgery I didn't feel weak and incapable of dealing with life's necessaries. One of the good things about living on an 18 ton boat alone is that I am not tempted to do fool hardy things like moving in extremely high winds. Given that people are dying from this strain of flue and many folks are waylaid for two weeks or longer before beginning to recover, I feel grateful I can say that I have turned a corner and I can feel myself gaining ground. I believe I owe the short duration to Sambucol so I share this with you dear reader, in the hopes like so much else, that it might offer you aid should you need it. 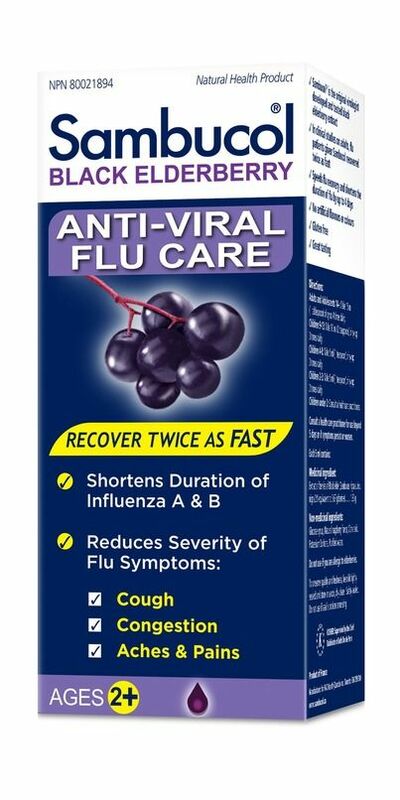 Sambucol is an anti-viral developed by the Israeli's decades ago to combat the flu virus. It is made from black Elderberries. I have read that for some patients who are most at risk of dying from the flu (the young, the elderly and the immune compromised), their physicians may prescribe an anti-viral of pharmaceutical manufacture. Now you know there is another alternative available at your local health food store. Over the past two weeks I have had several visitors. Ken and Sue Deveson (NB Cleddau) came over with an 80 liter bag of cocoa shell from their latest consignment. I shan't need another for at least two years! We had a wander over to view their boat which is out on the hard standing at Aqueduct marina awaiting blacking and painting. We had lunch in the marina cafe and too soon Ken and Sue were off back to Bedfordshire having satisfied their boaty needs for a while. Many thanks for the compost delivery and the delicious Welsh Cakes! The UK has been buffeted in the past two weeks with very high winds from a series of storms off the Atlantic. Two nights running the winds were in excess of 70 mph here and I took a "video" at two o'clock in the morning to share with you. It is pitch black in the boat so you will not actually see anything but you should be able to hear the sound of the wind--from inside the boat which will give you a good idea of what it is like to lie in bed as the storm surges around the boat. Love in a tub: Ken Deveson's homemade Welsh Cakes! I am not sure what kind of bird this is but it appears to be a bird of prey. It has staked out a territory along the cut where the picnic tables and BBQ frames sit about 500 feet before the entry to Aqueduct Marina. This was taken right outside my window. A few days later I had a knock on the side of my boat and there stood Angela and Steve from NB Tumbleweed No. 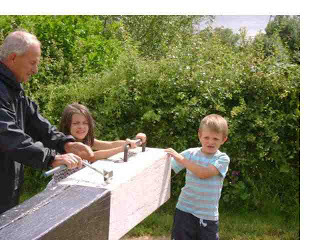 5, currently moored in Overwater marina at the bottom of the Audlem flight. 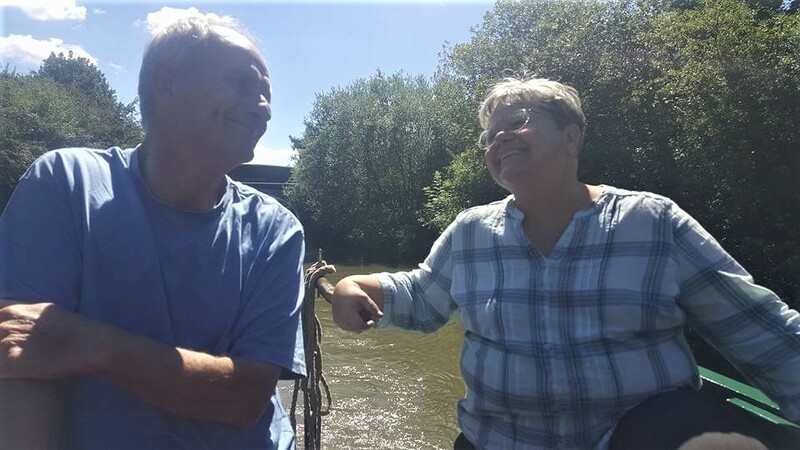 They no longer blog but when they did Les and I enjoyed their posts and we picked up a lot of good tips; they read our blog and decided to install an Airhead Marine composting toilet. So it was with great pleasure I welcomed them both aboard NBV. We had a lovely long natter which brought sunshine to my day. They picked me up and we drove to Overwater to see their boat which is very sweet and homey in its layout. I do love seeing other boats. Every single one of them has some great idea incorporated. We walked around Overwater which is a very large, well laid out marina. They are on a linear mooring which can take two boats--one in front of the other. The marina is very spacious. 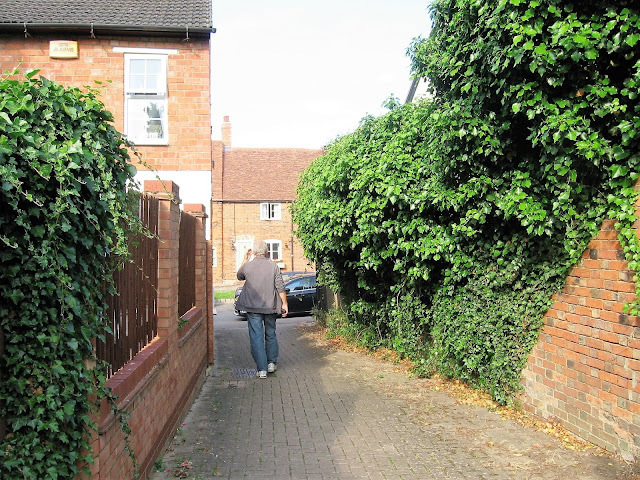 It is about a twenty minute walk to the bottom of the Audlem flight. The three of us lunched at the cafe and had a natter with one of the locals who has been a boater for many years. Many thanks to you both for a fun day out and a chance to get to know you both further. And thank you for welcoming me to the area. I look forward to getting together again soon. Of course in typical fashion I forgot to take pictures of Steve and Angela on their visit so I shall have to try and remember next time. I forget to pick up the camera when the conversation is good! 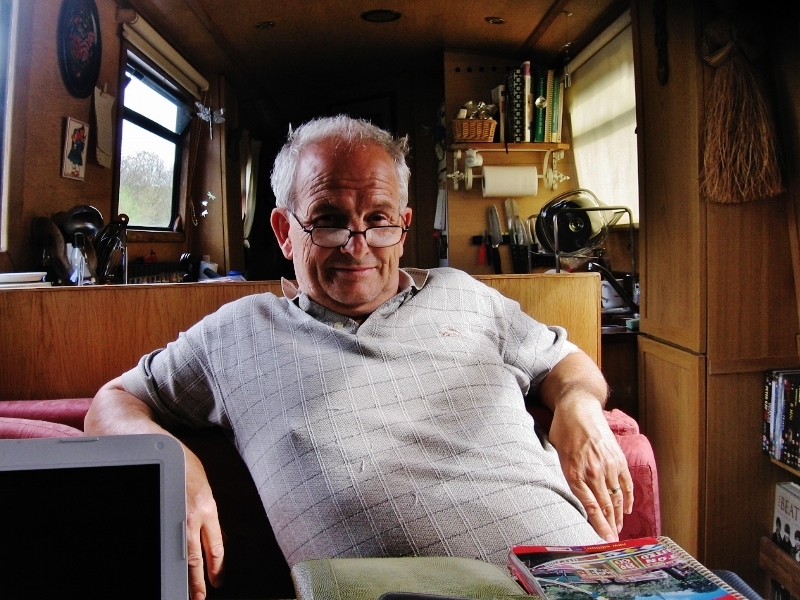 After ten days in Aqueduct marina in which I did not set foot outside the boat, I looked at the weather last Thursday night and realized I would only have a one day window of sunshine and no wind in which to cruise and I needed to get to Nantwich, so on the 27th I made my move. I've pinched a nerve in my left shoulder and the three fingers on my left hand have been numb for days. I need to see the chiropractor, check the mail, and get a few groceries in. Still weak and shaky, I thought to moor up before each of the two locks in front of me, suss them out, set them and then slowly bow haul the boat into each one. As I approached the bollards at the first lock landing a couple was out walking in the sun and he waved me on saying, "The gates are open in your favor." "I know but I cannot climb lock ladders. I need to get off and bow haul the boat in." "Toss me a windless Hen, and we will do the lock for you." With a smile and a wave of thanks I tossed him a windlass and cruised gently into the lock. They are boaters too, living on their baot which was moored up above the lock about a half mile. I thanked them for blessing me with their help and continued onward. At the bottom Chalmondsten lock, adjacent too Venetian marina I pulled over with a windlass in hand and was tying up when a bloke came along walking his dog on a lead. "Yes I am," I smiled. "It's a lovely day to be out and about isn't it?" "Lend me your windlass and I'll do the lock for you." "Oh thank you very much. That's very kind of you. Are you a boater?" "Yes that's my boat over there," and he pointed towards the marina. Soon enough I was at the top of the lock where a boat was waiting to go in. He handed me my windlass. "Thank you very much for your help. You really blessed me today." We smiled at one another and I was on my way once more. It took me five hours to cruise six miles owing to the long lines of permanently moored boats along the upper end of the Middlewich Arm. I don't remember there being so many when Les and I were here in 2012 but I supposed like everywhere else along the cut, it is filling up here in Cheshire too. Eventually I made it slowly past the long lines of boats approaching Barbridge Junction. I sounded the horn and slowly made the turn left onto the Shropshire Union Canal and my heart leaped and lifted at the sight of the Welsh hills in the distance. My spirit felt the rightness of this place and I knew I was where I should be. I moored up at 4 pm about a fourth of a mile past the Nantwich aqueduct and the stairs down to the town, knackered and spent. I knew my larder was empty so I switched coats--I wear Les' green down jacket for cruising and my black down coat for town--grabbed my grocery bags and backpack and set off for town. It took me three hours to walk the round trip of two and half miles there and back with shopping in between. I stopped in the darkened square to rest and listen to a busker with guitar sing his last song as it echoed against the wet stones of the empty square. 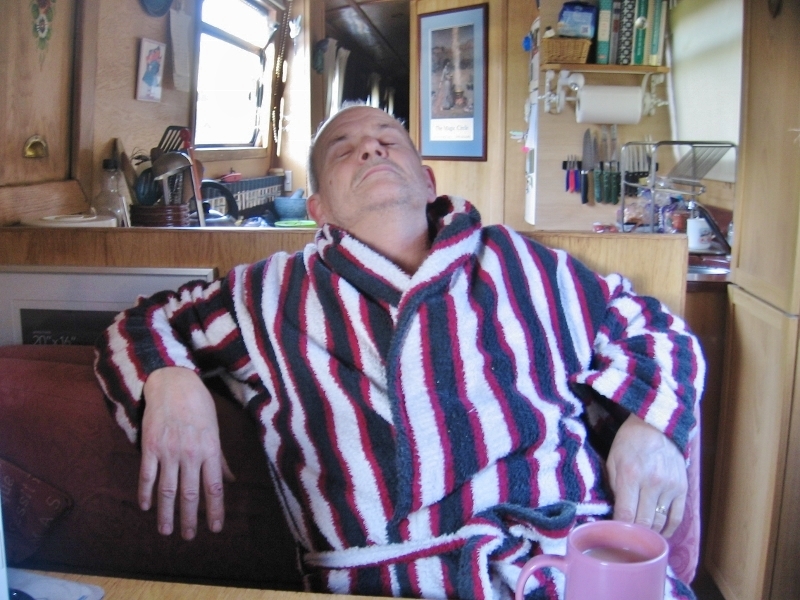 Back aboard NBV I slept well that night. 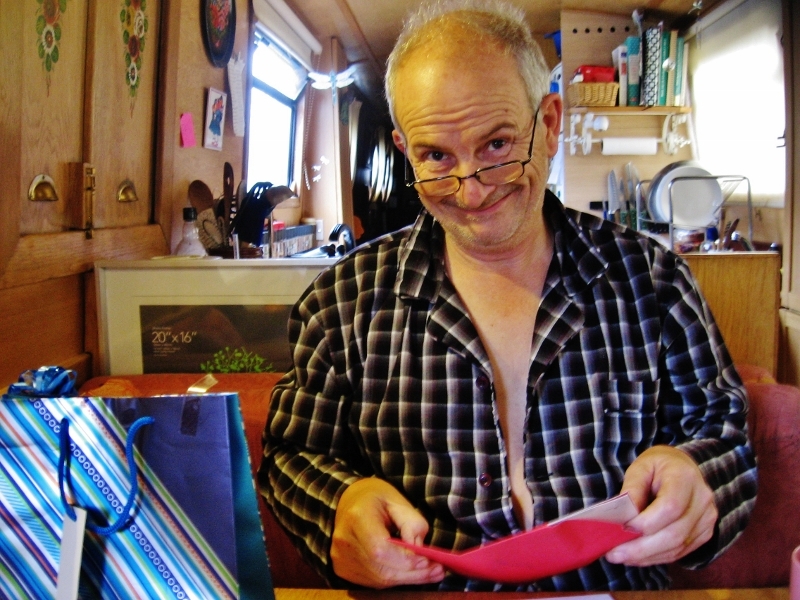 I have taken a mail box at the laundrette in the Nantwich Canal Centre and they texted me last Wednesday to say, "You've got mail," so yesteray I waited for the rain to lift and walked in to pick up my mail--a letter from the States and a card from someone over here! What a lovely surprise to open it a find a beautiful card with a Daffodil on it from dear friends, remembering me and Les. A walk in the other direction up Welsh Row and into the town square for a Saturday paper brought me up short against a massive, milling crowd of people rammed tightly packed all around the edge of the square. Behind them, lined up in regiment formation were soldiers dressed in both Parliamentary and Royalist regalia. Some held long sharp pikes and others muskets. Horses with riders astride led the procession. I was only about fifty feet from the W.H. Smith news agent's shop across the square but there was simply no quick and easy way to make it across so I waited with the milling throng. Soon drums began to sound, the assembled men and horses began to move at a marching pace and both armies wended their way through the narrow cobbled lanes of Nantwich, out to the battlefield just at the edge of town. I nipped in for my paper, accompanied on the walk back home to the reports of musket fire and the booming sound of cannon. The battlefield reenactment is undertaken by a group called The Sealed Knot. 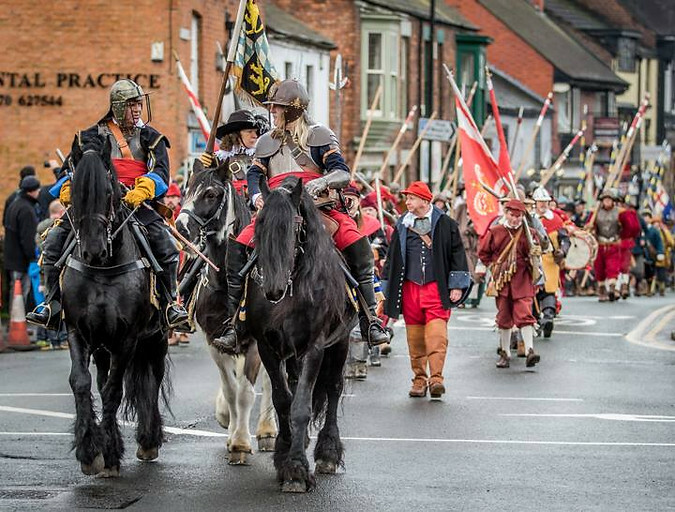 It commemorates a battle to the break the siege of Nantwich which took place on January 25th, 1644. Pictures courtesy of Eric Price. One of the lovely things about being up here is the Freeview television stations I can tune into with the antennae. One of them is a Welsh station. It airs programs I've seen on the BBC and ITV but they are all voiced in Welsh! I cannot understand a word of it, but the sound of it is a song of balm to my heart. I stretch out in Les' recliner in the evening, close my eyes and listen to the lilting cadence, and I am taken back to my childhood when my mother's mother Grandma Lilly used to come for a visit and stay for months at a time. I loved it when Grandma would come and stay with us. For the duration of her visit my parents were on best behavior--even my step father would not come home drunk or engage in any abuse while she was in the house. Grandma's visits were a hiatus from chaos and terror. She was Welsh and I loved the sound of her accent. When I was very small, she would watch me while my mother was at work. At nap time Lilly would fold a large blanket into a triangle and place it across her shoulders. She gathered me into her lap and pulled the blanket around us both--a makeshift Welsh nursing shawl. We used to sit together at the breakfast table sipping tea Grandma Lilly made strong and dark, sweetened with milk and sugar. She would pour a bit of her scalding tea into a saucer and give to me to sip. We also used to enjoy a shared breakfast of pickled pig's feet! At age four I had no idea what I was eating but it was vinegary which I loved and Grandma Lilly loved them so I did too but I did draw the line at tripe and boiled cabbage. I have begun to establish myself in Nantwich and I am applying for jobs in the area. The entire employment thing is completely different over here to the States and there has been a steep learning curve for me. I had to research the definition of GCSE's, NVQ's, and ECDL's. I was ready to beat my head against the table in frustration at being asked to enroll in a six month course to earn national qualifications for something I've done to a very high degree for over a decade. This is when local knowledge comes in valuable. Angela was a teacher in her pre-boat life and she told me to apply for positions I am obviously qualified for due to experience. Once hired if the employer still wants me to earn an NVQ they will likely be willing to help make that happen. Carol Palin (NB Still Rockin') has also been a wonderful sounding board offering great practical advice. Many thanks to both of you lovely women for your help. 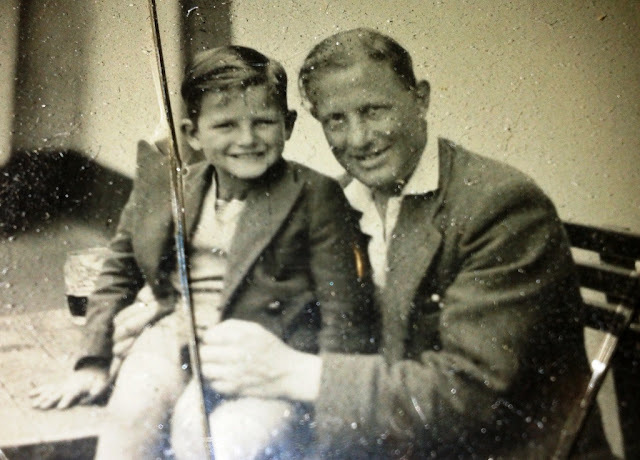 Les as a small boy with his dad about 1953 I think.Here is link to my all time favorite blog post written by Les which tells of his childhood on the Paddington Arm of the canal into London. 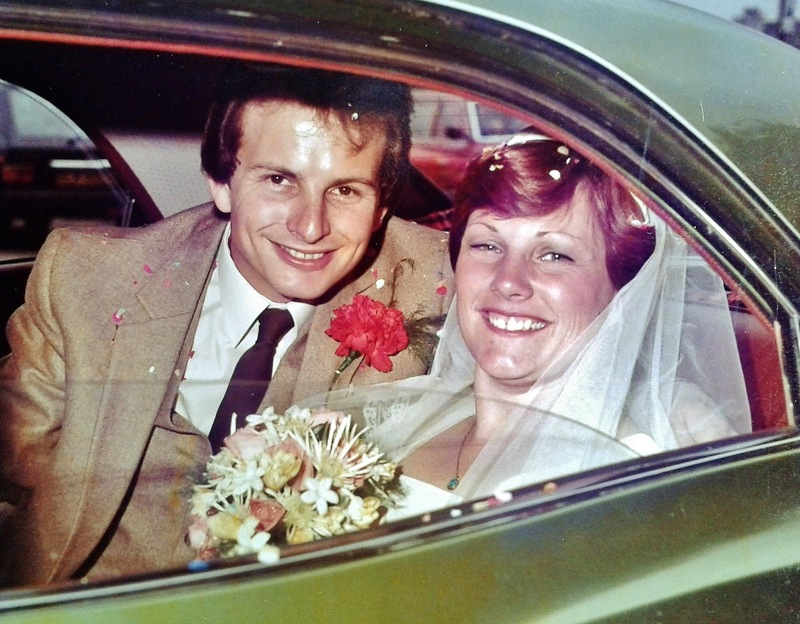 Les and Valerie on their wedding day. Les holding his new granddaughter Kiera 2006. He adored babies and children and they seemed to feel the same about Les. 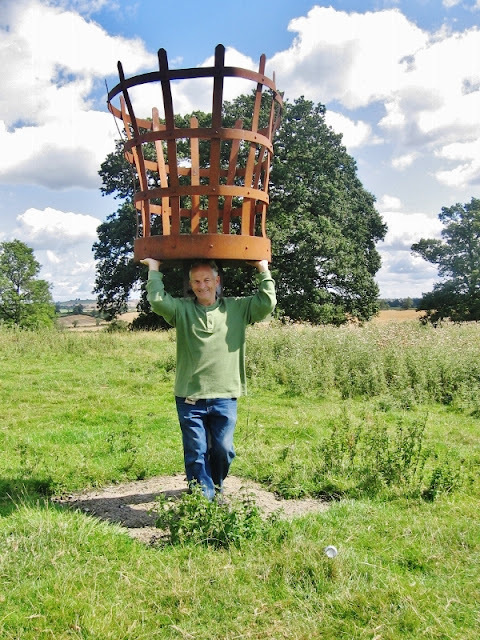 Les in stocks at Hatton, 2007. 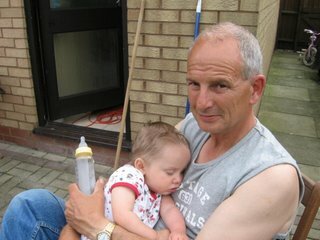 Les with a handful of lovely grandbabies (Teo, Kiernan and Kiera), October 2007. Granddad with Jordan and Jack, Warwickshire, 2008. Les' helicopter trip to the Grand Canyon, USA. October 2010. Two friends who have no clue what lies in store for them, Cloudhouse, Pullman, Washington, USA. October 2010. Les advertising a free chair to a good home to make room for two new chairs for us both, May 2011, Great Linford on the Grand Union Canal. 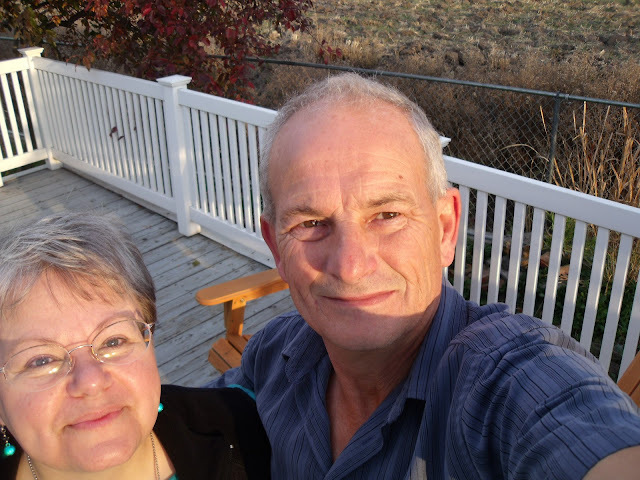 Les and I at daughter-in-law Bev's home in Watford. A family party held in honor of our upcoming wedding, May 2011. Cruising May 2011 before returning to the USA to get married. My favorite boater. 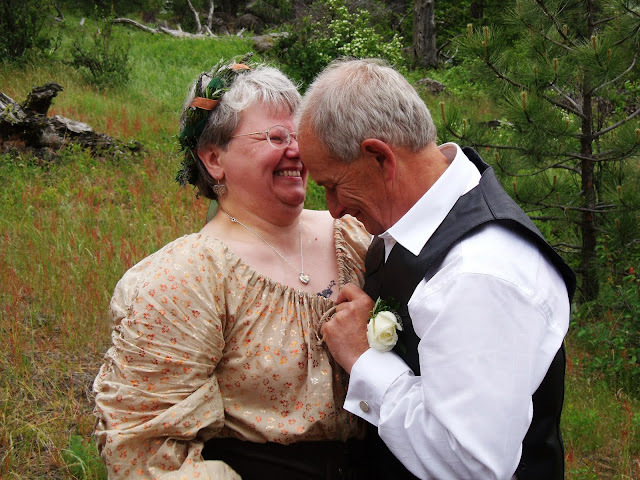 Our American family on our wedding day, June 2011. (Left to tight: Grandson Michael, me, grandson Matthew, daughter Shiery -AKA Sparky, Les, Son-in-law Ben, daughter Jesse with baby Connor. Our wedding day. Les is peeking at my new tattoo, June 2011. The happiest couple in the world. Newlyweds hiking up at Kamiak Butte where we were married a month previously. July 2011, Pullman, WA. USA. 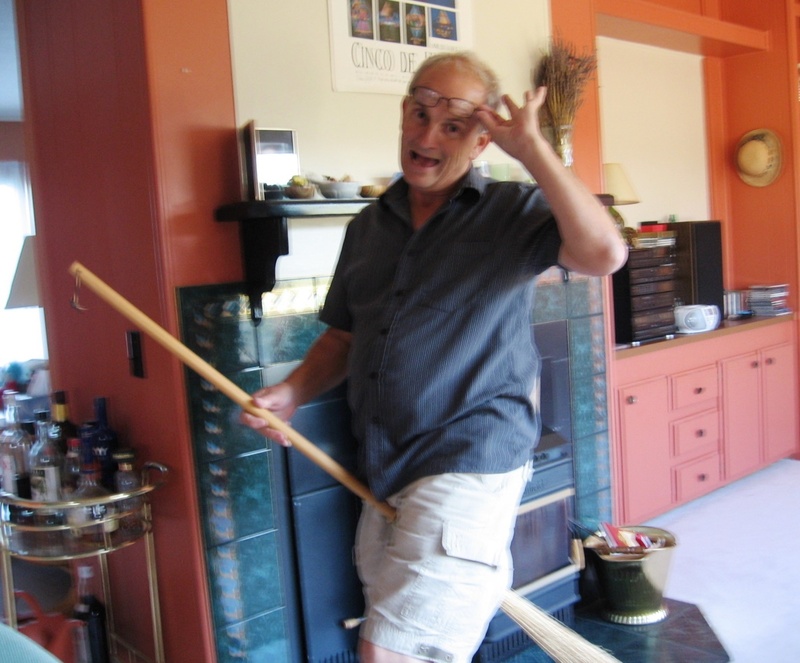 Les attempting to make my broom fly! Cloudhouse, Pullman, WA. USA. August 2011. 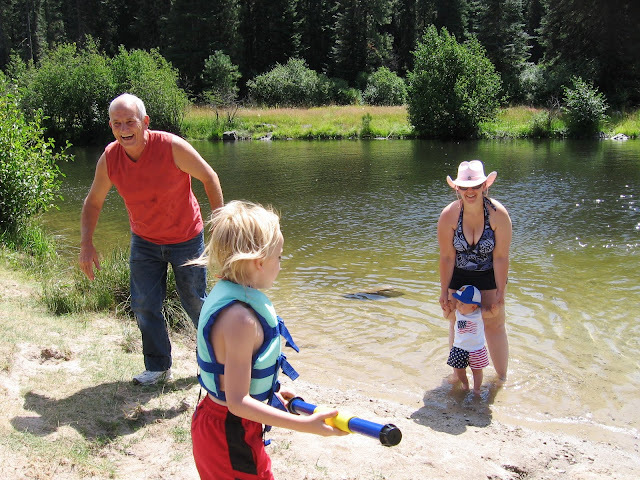 Grandpa Les playing in the water with grandsons Matthew and Michael who is out of the photo shooting at Les with a water cannon while my daughter Jesse and baby Connor look on. July 2011. Les taking a spin on our friend Karen's Segway. the hat was mandatory gear for the ride. July 2011, Pullman, WA. USA. 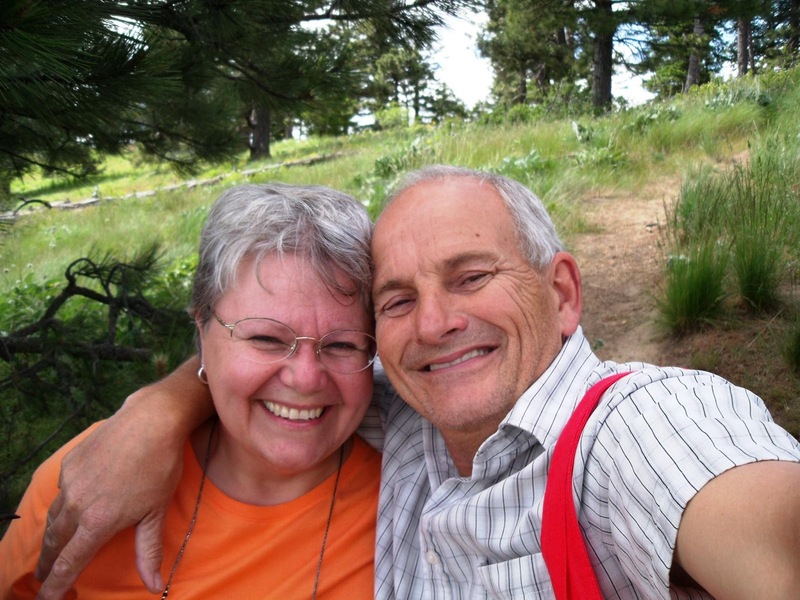 Les with our dear friend Sandy Field, August 2011, Pullman, WA. USA. Les enjoying a moment on our honeymoon drive West from Pullman to Seattle on our way to fly home to England, September 2011. ...until presents appeared! 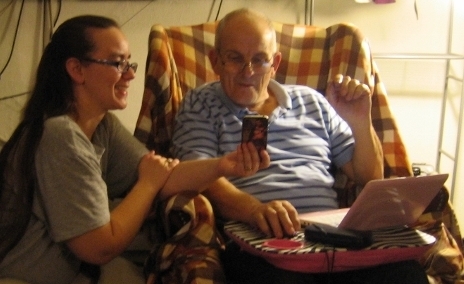 Birthday boy, March 19th, 2012 with his new Kindle. Les taking the mick with me for taking his picture first thing! Mwah! 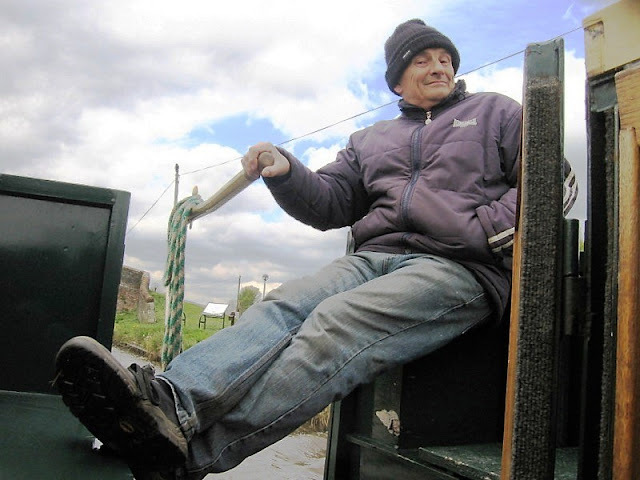 Best Beloveds on the packhorse bridge at Great Haywood on the Trent & Mersey canal, March 2012. 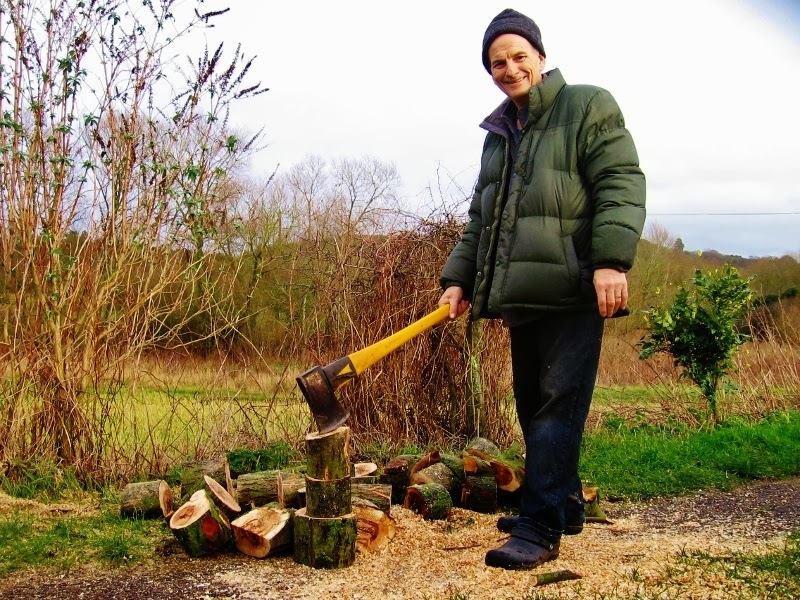 My baby doing his next favorite thing to cruising: chopping wood. The Shroppie canal April 2012. 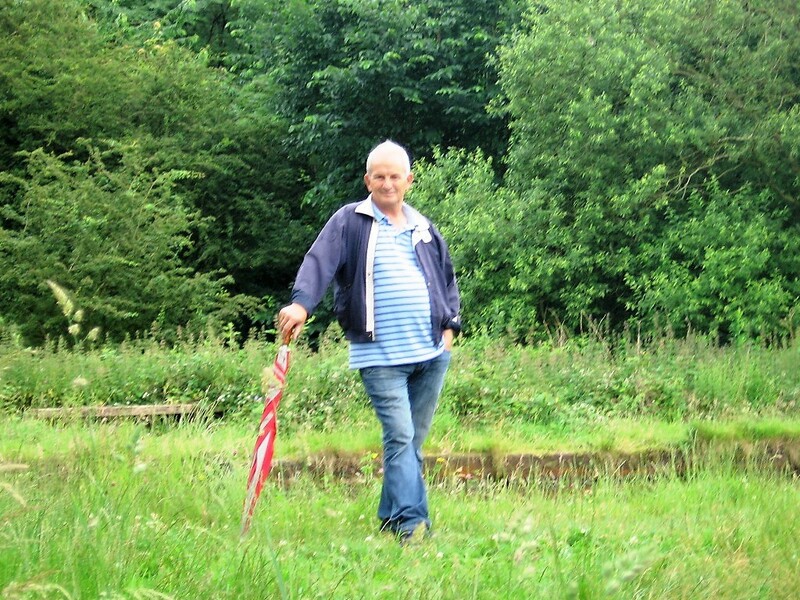 Les posing for me at Dunham Massey estate on the Bridgewater canal, summer 2012. 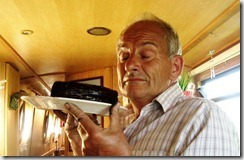 Les smelling a freshly baked Kahlua Chocolate Cake, Cavely, the Shropshire Union Canal, May 2012. Les doing his bluebird of happiness impression, flying down the lane. Llangollen, spring 2012. 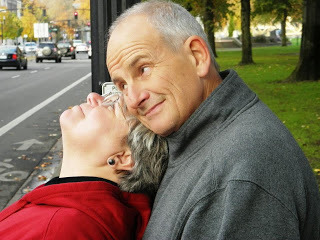 Me and Les in Portland, Oregon for our daughter Sparky's wedding, November 2012. Les cuddling me while I fix dinner for our family. Daughter Jesse is working on wedding favors for her sister's wedding. Portland, Oregon, 2012. Daughter Jesse sharing pictures of her boys with Les. Portland, Oregon, November 2012. 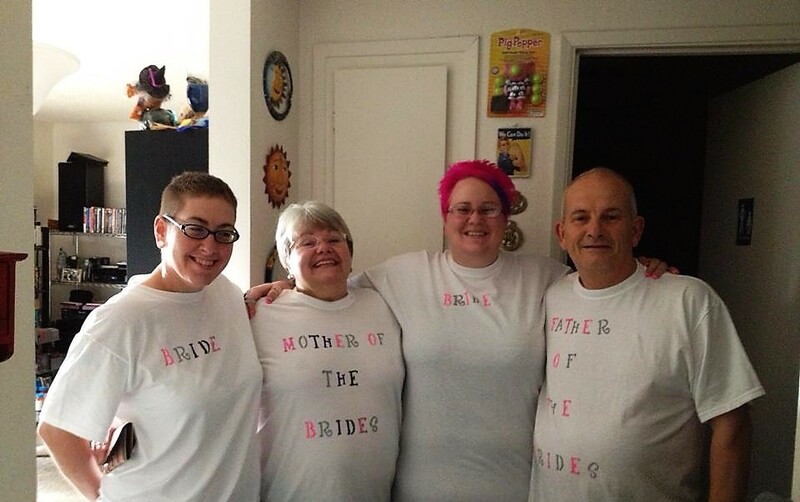 Mother and father of the brides preparing for a whirlwind day before the wedding, November 7th, 2012. Les looking so handsome and proud of our daughter Sparky and our daughter in law Kelli. 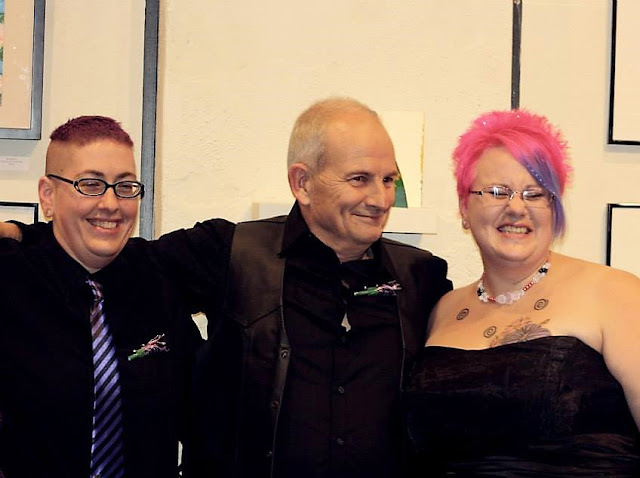 Les walked Spark down the aisle and handed her over to Kelli on November 7th, 2012, Portland, Oregon. 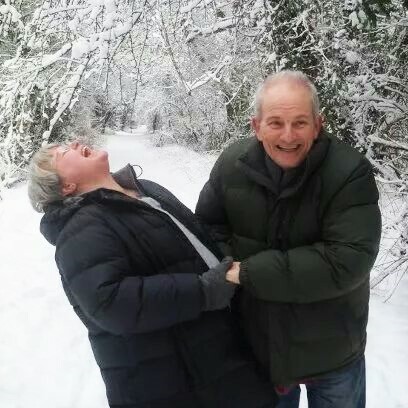 Les and I playing in the snow, Blisworth, 2013. This is the essence of our marriage and who we were with each other. We had so much fun together. I had his wedding band engraved with the words "You are my joy". 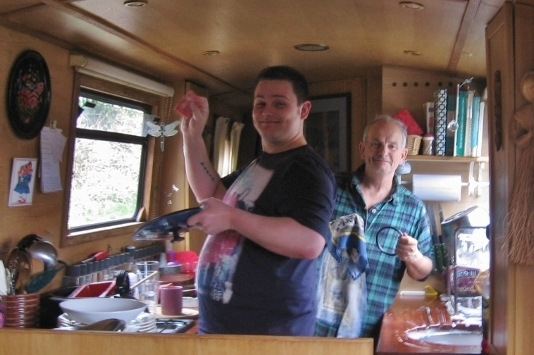 Son Kevin and Dad cleaning up after a family spaghetti dinner aboard NB Valerie, March 2013. Les opening his birthday gifts, March 19th, 2013. 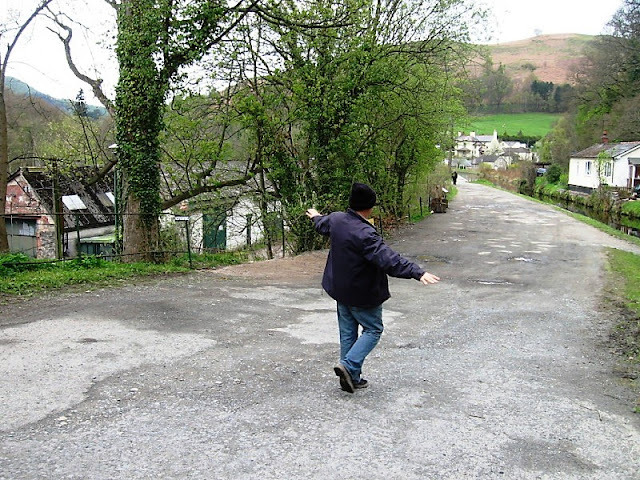 Les' distinctive stride. I could always recognize Les by his walk long before I could see his features. Weybridge, The Thames, May 2013. This series of three photos were taken on the Lee and Stort near Waltham Abbey, June 2013. 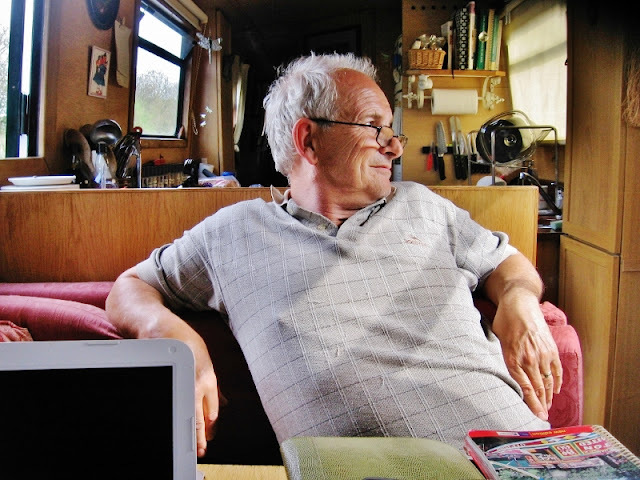 What you cannot see is what Les saw when turning to look outside: the water was low so the boat was sitting quite low in the water and the towpath was about half way up the window. Outside a couple stopped to talk with someone and the woman was standing with her back to Les. She was wearing a pleated skirt which was waving precariously in the breeze, nearly sharing her Victoria's Secrets with us! Les' facial expressions spoke volumes. My hero! 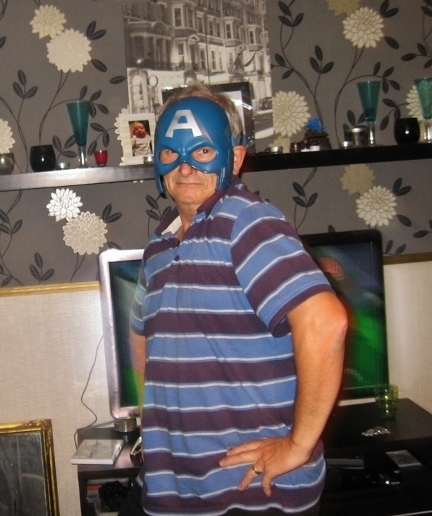 Les in grandson Kiernan's Captain America mask, 2013. Les holding up the Jubilee beacon on the top of Crack Hill overlooking Crick, Leicestershire, September 2014. 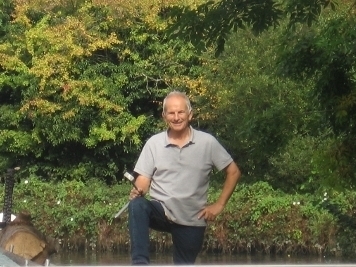 Les working the locks on the Hatton flight, September 2015. Les still collecting firewood for us, October 2015 above the Lapworth flight. 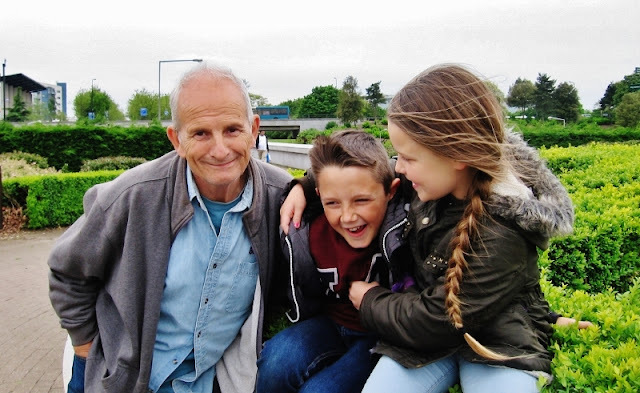 I love this picture of Les and two of our grandchildren Kiernan and Kiera, taken at Campbell Park, October 2015. July 2016. The love in Les' eyes as he looks at me is so deep and sweet. I see it in every picture I have taken of him when he is looking only at me, even if he is in a photo with others, like the one I took just above. I know he he is telling me with that look, "I Love you Jaq and I always will." 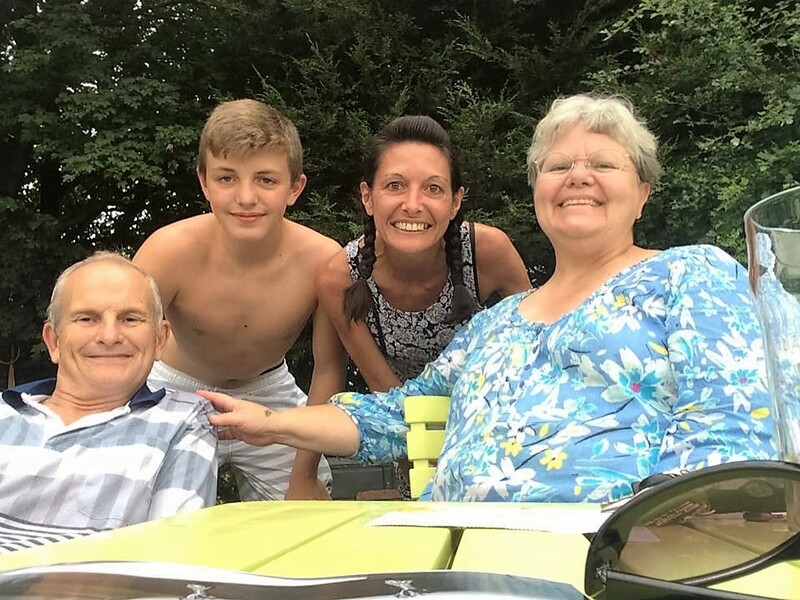 Les, our grandson Jack, daughter in law Bev and me, Cow Roast, August 2016. August 2016, Cow Roast. 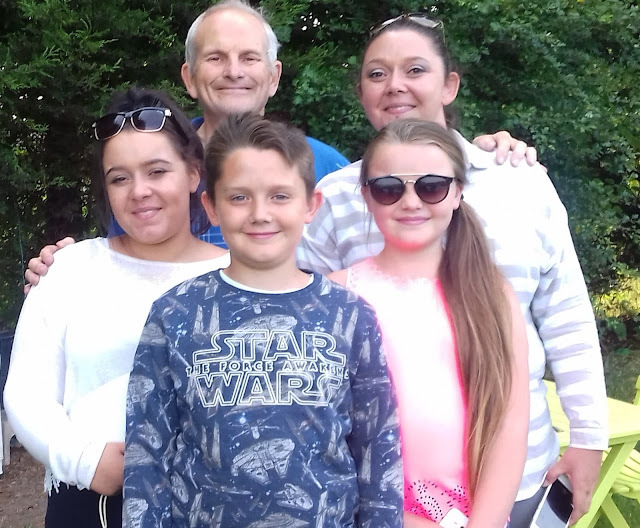 From Left to right: Granddaughter Lena May, Les, Grandson Kiernan, granddaughter Kiera, daughter in law Joanne. 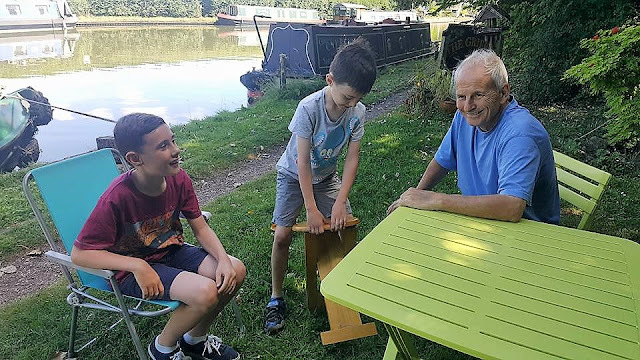 Granddad having a moment with our two grandsons Teo and Battu. Cow Roast, August 2016. August 2016, Les and I on our last day of cruising ever. We know death is waiting for him in the near future but in this present moment, this one glorious, sunny summer day, we focus solely on each other. Every second we have left to spend together is more precious than gold. My deepest gratitude to our daughter in law Ozlem for capturing this moment.